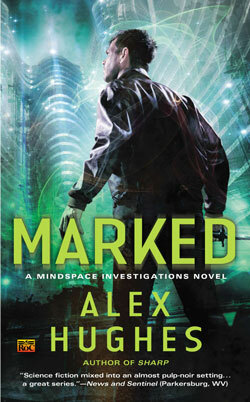 Alex Hughes’ Mindspace Investigations series has been described as a mixture of “Chinatown” and “Blade Runner.” Just days away from releasing the third a planned nine books, she stops by Skipping Midnight today to talk about the next installment … and to give one lucky reader the chance to win an electronic copy of RABBIT TRICK! 1. You are just a few days away from releasing the third book in your Mindspace Investigations series. What can you tell us about the story? Thank you for having me on the blog! I’m very excited about the upcoming release, and of course, I’d be glad to share details. The series is about a telepath who’s a recovering addict working with the police in future Atlanta to solve crimes. In this book, Adam’s ex-fiance calls him to investigate a suspicious death at the Telepath’s Guild, and Adam finds himself juggling both a Guild case and a police case, the latter a brutal axe murder. Will he be able to keep all the balls in the air? If he doesn’t, he’ll lose more than just his job. 2. What do think people will love most about the series? What do you love about it? Adam is a very real character with very real problems, and getting deep in his head (and, through him, in the heads of others) is a cool experience. I love the contrast between the futuristic world (flying cars!) and the post-Tech Wars lack of computer technology, and I love getting deep into the Telepath’s Guild with all their powers and all their agendas. I also love the cop-show feel of the cases, as Adam and Cherabino fight for justice one case at a time. I try to be true to the expectations of both mystery readers and SF readers and the mix, I think, is cool. 3. In addition to the three books, you’ve also written a prequel and novella for the Mindspace Investigations series. Is MARKED the final installment? If yes, what are you working on next? If no, how far do you see the series going? 4. Is urban fantasy your genre of choice, or do you read/write about whatever strikes your fancy? Where do your ideas come from? I like a little bit of everything when it comes to reading and watching TV, etc. I very much love both cop shows and science fiction/fantasy, so this series has both. And I always have a nonfiction obsession–for this series, it was a combination of physics from school and brain and behavior studies, as in Oliver Sacks’ The Man Who Mistook His Wife for a Hat. I love playing with the rules of real life and science in new and interesting ways. My ideas usually come from some spark in the real world in this way, but I try to take a big step outside that real world and let the universe develop on its own. 5. What is your writing process like? Lol. I call myself a recovering pantser, meaning by nature I write by the seat of my pants. But to meet deadlines and get more efficient in my process, I’ve added in a lot of planning, some of which gets thrown out along the way. I set up my window boxes and I plant my seeds and I pray until the story starts growing on its own. If I have to throw out some of what I’ve done and start over, or add something new, I do. It’s a messy, messy process, but so worth it. I’ve been fortunate enough to work with Roc, which is a major imprint from Penguin, but in a lot of ways it’s the same for any author who’s not a bestseller. You have to go to conferences, enlist relatives to hand out bookmarks, do blog tours, and give away whatever books seem reasonable. I’ve gone to library events, I’ve talked to countless people, and I’m building an email newsletter (free short stories about every six to eight weeks! Sign up at www.ahugheswriter.com/email-signup!). I’m also on Twitter sometimes talking about my current obsession, and blogging sometimes on my website. It’s definitely a work in progress, and I’m by no means an expert, but there’s nothing so wonderful in the whole world as hearing from a reader who loved my work. 7. Becoming a published author is never an easy path. How do you make it through the tough days? Chocolate, wine, prayer, and the support of friends and family. It’s a hard road. I also have a Happy File in which I put emails from fans, good reviews, awards, and anything else that will remind me why I do what I do. When I get too down, I look at the happy file, and that helps a lot. Publishing is rough. There’s a lot of uncertainty, and a lot of things outside your control. You have to learn to focus on the things you can control, and trust that the rest will work out. It’s the only way you stay sane. That and chocolate and happy files. Apex Magazine had a quote up a few years ago–“When you get rejected, don’t get angry. Instead, become more awesome, and more awesome, until we have no choice but to accept you.” I eventually found a way to do just that, and it has made all the difference. To keep up with Alex, visit her website at www.ahugheswriter.com or Facebook page. 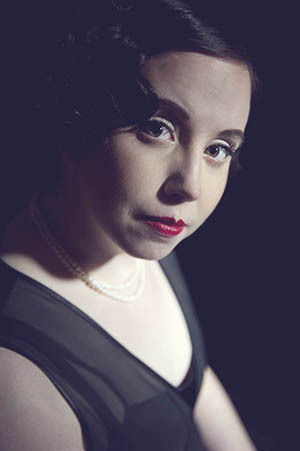 She is also active on Goodreads and Twitter (@ahugheswriter). Comment below to win an electronic copy of RABBIT TRICK. The giveaway will remain open until 11:59 p.m. Friday, March 27 (PST), at which point a winner will be chosen at random. Best of luck to you all! Love this series! Adam’s such a broken protagonist; it’s great watching him piece himself together again. Hope I get Rabbit Trick! I haven’t read your books yet, but I’ve added them to my “to read” list. I enjoy storyline that include the powers of the mind.